We have this "stress" of doing something all term long. On mondays all my boys classes write about what they did on the weekend. Fortunately, I discovered this quite late in the year, so I haven't worried about it too much. There are many pages of my boys saying they did nothing, or watched tv. And, much to my frustration, even when we do do something, they still write the same thing. Often they make something exciting up with one boy wrote they they went to disney land on the weekend!!! We do lots of nothing too and it's usually by choice. The kids do enjoy a rest as do I. You know I never find it hard to entertain my kids but maybe because the 2.5 and 4.5 are great at amusing themselves. Miss 6 can be a little 'tough' at times! I hope yours are happy and fun! When they've got little missions that they've invented themselves - it's great isn't it! My kids are having a very boring school holidays and I don't feel bad about it at all!! Ann, this week my kids are having a lovely boring time too - there's cushion throwing, yelling, mess and junk food and they seem pretty happy about it! Some great things on for kids in the cities! The supermarket gets horrible doesn't it. Fabulous baby-led selfie!! That is such a clever, artistic shot! I miss the endless summer holidays when I was a child! My fave thing to do was to go strawberry picking. Nice Post. pictures are look beautiful.thanks for sharing. 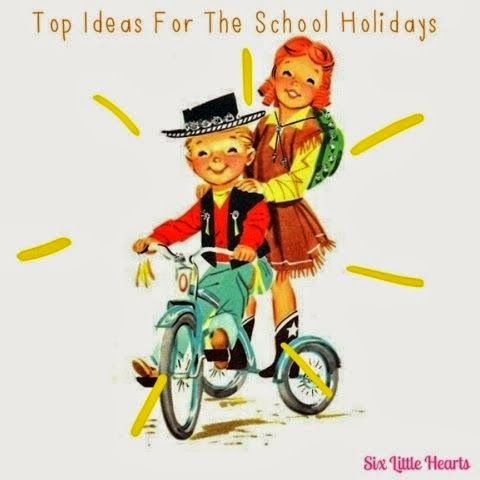 Good ideas, This is very helpful to enjoy holidays. Thanks for sharing. Wow! very nice post.I like your blog. Thank you so much for sharing.